A week of fun and learning awaits your child at McWane Science Center Summer Camp. Weekly camps begin on June 3rd and end on August 2nd. There will be no camps the week of July 1st-5th. Get a jump on learning with our STEM Academy Camps! These camps are designed especially for students starting school later in the summer. In STEM Academy Camps 1 & 2, kids will imagine, investigate, problem-solve, practice critical thinking and communication skills through fun and engaging activities. We’ll have an end-of-summer blast exploring Science, Technology, Engineering and Math in the real world. The deadline for registering for the STEM Academy Camps is Friday, July 19. This camp is especially designed for girls entering the 4th – 8th grades, who are interested in STEM. The goal is to inspire curiosity and creativity and help girls develop an interest and confidence in STEM through engaging experiments, conversations, and demonstrations led by inspiring female role models. Plus, we’ll have loads of fun at the same time. Campers should register in the camp of the grade they will be attending in the fall of 2019. Each of our camps is designed for the skill level of that camp: therefore, grade levels must be observed. Enrollment is limited to ensure a quality experience. Registrants may attend only those camps for which they are registered. Registrations are not transferable. Registration closes the Monday prior to the first day of camp. Please note that PreK-Kindergarten campers must be four years old and potty-trained by June 1st. Please see the Online Registration FAQs if you need help with registration. Please see the Online Registration FAQs if you need help with registration. McWane Science Center reserves the right to cancel camps that do not meet minimum enrollment. If a camp is cancelled by McWane Science Center, a full refund will be returned to the registrant. If a registrant cancels a camp, a 50% refund will be made if the registrant notifies the Camp program in writing, which is emailed, postmarked, or faxed no later than 10 working days prior to the camp. Otherwise, NO REFUNDS, will be made. There is a $35 service charge for any returned checks and enrollment will be automatically cancelled. Both before and after care are included in camp registration. Before Care is available from 7:45am-9:00am and after care, for campers in 1st-7th grade, is available from 4:00 pm-5:30 pm. Activities and games will be provided during these times. Pre-K-Kindergarten camps start at 9:00 am and end at 1:00 pm Campers may be dropped off no earlier than 7:45am and must be picked up no later than 1:00 pm. Pre-K-Kindergarten campers MUST be picked up by 1:00 pm. All other campers MUST be picked up by 5:30 pm for afternoon camps. There will be a $5 late pick up charge for every 10 minutes your camper stays after pick-up time. NO EXCEPTIONS. Hot lunch and snacks are included with your camp registration fee. Lunch time is 12:00 pm to 1:00 pm. Campers are supervised during lunch and activities are provided. Our menu is an attempt to avoid most common food allergies like nuts and strawberries. If you have additional dietary concerns you may send a lunch with your camper. No refund or discount will be given for these days. PLEASE REMEMBER TO INDICATE ALL ALLERGIES ON THE MEDICAL RELEASE FORM, as we will adhere to those guidelines. Digging Dinosaurs – Grab your fossil tools and let’s start digging, as we uncover the prehistoric world of dinosaurs. Touch a real fossil and discover your own! What will you find today? Sounds of Summer – Chirp, Ribbit, SPLASH! Get ready to use your listening ears as we learn the science behind some of summer’s most recognizable sounds. Cue the cicadas; Buzz, Buzz! Little Explorers – Don your magnifying glass as we discover the great outdoors! Do trees have birthdays? Are all rocks the same? Why do leaves change color? Come find out, as we explore the world around us. Animal Antics – From lion’s dens to spider webs, this week is all about animals. Uncover unique habitats and the animals that call them home. Look closely, though; some of them may be camouflaged. Deep Blue Seas – Dive right into the sunshine zone! Did you know that the sunshine zone is home to 90% of the ocean’s animals? This week in camp, we’ll learn all about the five layers of the ocean and reveal a few deep-sea oddities. Astro Tots – Blast off into an out of this world adventure as we explore planets, moons, stars, and the astronauts who brave outer space. Our journey begins in 3…2…1! Silly Science – Take a walk on the silly side and encounter some scientific curiosities! Wiggly gummy worms, dancing glitter, and static hair-dos aren’t the only things we’ll be giggling about! Little Chemists – Colorful eruptions and fizzy concoctions! Join us as we explore the basics of chemistry through hands-on experiments and exciting demonstrations. Grab your goggles because things are about to get bubbly! Solve It! – The game is afoot! Junior detectives, put on your problem-solving hats and unravel baffling mysteries at McWane, with the help of forensic science. Robot Roundup – What makes a machine a robot? Come find out by imagining, building, and programming your own ‘bots, with a little help from mechanical assistants. Camp Cretaceous – The age of the dinosaurs returns! Examine fossils and the extinct creatures that made them, and learn why Alabama is one of the top states for unearthing our ancient past. Magic School Bus Adventures – Buckle your seatbelts, because Miss Frizzle has a classroom unlike any other. Start each day with a book from the acclaimed series, then board the world’s greatest bus for an incredible tour of science. LEGO Builders – Beginners and master builders alike are invited to join us as we assemble science, with everyone’s favorite interlocking bricks. No Kragle, please. Space: Countdown – Fifty years ago, this week, Apollo 11 was making one giant leap for mankind. Celebrate the first moon landing, explore the planets and stars, and find out what it takes to reach, and survive in, outer space. Creature Care – McWane’s animals need your help! Go behind the scenes with our staff to learn how our friends eat, play, and stay healthy. Ch₁emistry₂ Matters (FULL) – Experiment with color changing reactions, gooey polymers, and unexpected changes. Put your goggles and gloves on for daily demonstrations of the most spectacular science ever, from fiery to super-cold to just plain weird. Junior Veterinarians – Land or sea, vertebrate or invertebrate, wild or domestic, Meet McWane’s animals, and get a behind the scenes look at how our staff cares for them. Campers will experience what it takes to keep mammals, reptiles and amphibians happy and healthy. Science Detective – Go undercover to snoop out the mysteries lurking at McWane. You’ll need all the skills of forensic science to crack this case. Science on the High Seas – Dive into the amazing life found in Earth’s oceans and McWane’s World of Water. Submerge yourself in a week of oceanography, exploration and conservation and explore ways to keep the oceans clean and safe. Design Investigations – From bridges to biomedical devices, McWane challenges young engineers to imagine and design solutions to real-world problems. Discover which shapes make the strongest structures and have fun demolishing them as we learn how architects make buildings strong. Space: Ignition – Fifty years ago, this week, Apollo 11 landed on the moon. Spend the week discovering how astronauts live in space, what powers rockets, and more, as we celebrate this scientific first. Robot Roll Call – Build and program our robotic fleet, including Ozobots and the latest LEGO® WeDos. Let’s see what makes these machines tick. 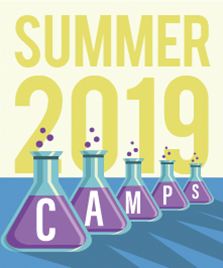 Ch₃emistry₄ Concoctions – In this hands-on chemistry camp, we’ll create crazy, chemistry concoctions that change colors, bubble, fizz, ooze, and more. Engineer It! – Dream big in this camp, that will dare you to solve unique engineering challenges. Build and test prototype solutions to given problems. Get ready to test your engineering skills – from buildings to innovative devices to McWane Science Center exhibits. Wizarding Academy – Accio campers! McWane summons you to a week filled with spells, potions, and magical creatures. Come along as we explore the science behind the magic. Myth Busting – From superstitions to urban legends to the fringes of science – is it possible? Or just a myth? It’s time to put them to the test. Robot Revolution – Delve into the programming and inner workings of robots as you explore the circuitry, software, and hardware of LEGO® EV3s, and the rest of McWane’s robot fleet. Sci-Fi Science – Droids, aliens and zombies! Oh my! Gear up for a scientific adventure through our favorite books, movies and more! Space: Blast Off – In celebration of the 50th anniversary of the Apollo 11 mission, campers will learn about objects in motion, magnetism and planetary science. We’ll investigate the size and scale of our solar system, learn about robotic exploration, and rediscover our own planet, Earth. Maker Week – Calling all makers! Get ready to put your DIY skills to use. Experience every step of the creative process from design, to the construction and testing of, a variety of amazing projects that move, light up and fly. The limit is your own imagination. Ch₅emistry₆ Chaos – Explore the basics of chemistry through explosive, vivid and thrilling activities. Create chemical compounds, analyze acids and bases, generate things that glow, and concoct a few combustible reactions. Sci Girls – Women have made incredible contributions throughout science history – are you ready to join them? We’re looking for girls in 4th through 8th grade, who love STEM, to explore a wide range of scientific fields and experiments.